The homologation of medical devices is a complex task It involves many standards and regulations, which are different from a country to another: FDA in the US, CE mark in EU, CMDCAS in Canada, KFDA in Korea, and so on. Fortunately, most of these regulations rely on ISO standards, the most important being ISO 13485 and ISO 14971 in the medical device industry. Hence if you meet the requirements of ISO 13485 and ISO 14971, you increase your chances of passing homologations procedures. Implementing these standards involves changes in the whole organisation of a medical devices manufacturer. But these two standards are not talktative about software,as they are of more general viewpoint. ISO 13485 requires to implement procedures to handle correctly the lifecylce of a product, with medical and clinical specific issues. These procedures are generally implemented as conception procedure, post market surveillance procedure, modification procedure. 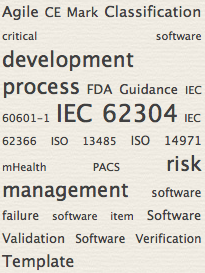 In ISO 13485, the word "conception" means the entire process of making a software. It is different from the meaning of "conception" found in computer science - a step in the development process between specification and coding.